Amazon Fire HD 8 (2018) review | What Hi-Fi? Given the current rate of Brexit negotiations, it seems feasible that in a few years time, getting a tablet of any kind for less than £100 will feel distantly utopian. Even now, for a tablet built to entertain, rather than to ingest, that price seems too good to be true. Especially when its list of features is as long as that of the new Amazon Fire HD 8. For up to 10 hours on a single charge, you can enjoy the delights of its 8in HD display by watching films and TV shows from your favourite streaming and catch-up services, browsing your playlists on Spotify or the like, or perhaps even making your own 720p videos with its 2MP rear-facing camera. The Fire 8 HD does pretty much everything you’d expect a tablet to do, even one further up the food chain. Being an Amazon product, it also features Alexa Voice Control – which will do anything from telling you the weather to playing your favourite music – as well as the ability to make voice and video calls (there’s another 2MP camera on the front) or message anybody else with a Fire tablet, Echo device or the Alexa app. Part of its beauty is that the Fire HD 8 tablet can be used by anyone, for a whole range of purposes. The range of finishes – Black, Marine Blue, Punch Red and Canary Yellow – suggests it will be used to watch Peppa Pig as much as Walking Dead, while its 16GB of memory can be expanded to 400GB by using a microSD card, which means it’s just as good for using as a kind of digital photo album. But the fact it does so much, for so little, makes this kind of tablet quite difficult to review. As long as it does what it says on the tin, that’s already more than we could expect for £80. It isn’t going to sate the appetite of those coveting a tablet for serious listening or film playback, but you know you’d have to pay up to four times this amount for that. And it is a capable performer in both video and audio respects. The picture lacks definition in the darkest scenes, and contrast isn’t spectacular, but its palate is natural and there’s plenty of detail to keep our eyes open. Its dual stereo speakers also offer decent audio performance for use without headphones when you’re not using your TV. Music playback is far from the most detailed, rhythmic or dynamic presentation we’ve ever heard, but it’s fine for casual listening. And need we remind you how little Amazon is asking you to pay? We’re also largely fine with the fact the Fire HD 8 has a little give to its back panel, because, especially if you’re unleashing young children upon it, it’s likely to be thrown around quite a bit – or at least chucked in a rucksack for the journey to work. Our main disappointment is the speed at which it works. It’s just the right side of being able to get used to, but apps can take a few seconds to load, opening just before we’ve forgotten what we were going in there to do. 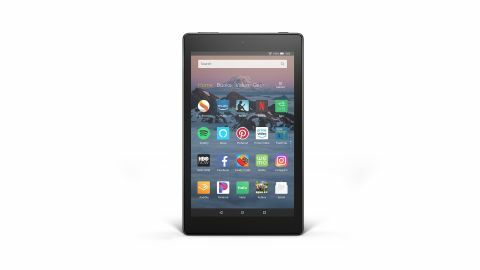 The Fire HD 8 houses a Quad-Core 1.3 GHz processor with 1.5 GB of RAM, but the next step up – to Quad-Core 1.8 GHz and 2GB of RAM with the Fire HD 10 – will cost you almost double the price, albeit with a larger, 10in screen.